When you have a Migraine or headache, do you use heating or cooling therapy? Do you reach into the freezer for a gel or ice pack or throw a pack into the microwave to heat up? If you do, the SootheAwayTM Continuous Thermal Therapy device is something worth considering. I'll admit that I was a bit skeptical, but that skepticism turned into a very pleasant surprise when I tried the SootheAway. With traditional cold and hot packs, I always have problems getting and keeping the temperature right. When I microwave a hot pack, it seems that I always get it too warm or not warm enough. Even if it's the right temperature, it doesn't stay that way very long. Cold packs are the same way. Straight from the freezer, they're too cold against my skin at first. Then they warm up too soon, and I have to get up to get another one from the freezer. SootheAway administers warm or cold therapy at the optimum temperature for relief by continuously circulating a distilled water through a therapeutic pad, which has been engineered to target specific pain areas. After you have selected the temperature level that provides the best relief for your pain area, the selected pad slightly inflates, creating a combination of compression and temperature that has proven to be effective for pain relief, relaxation, and healing. The cooling or heating pads stay on for as long as you need, and your hands remain free the entire time. Check the water reservoir to make sure there is distilled water in the SootheAway unit. Select the pad that correlates to the main location of your pain and attach it to the unit. Place the unit where you want it and plug it in. Turn on the SootheAway unit. Adjust the temperature as necessary. 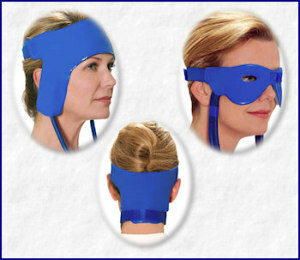 I first tested the SootheAway for a tension-type headache. It started low in the back of my head. If I don't do something about these headaches quickly, they often trigger a Migraine, so I'm quick to do something about them. I used the occipital pad, which is the center bottom in the image of the three pads. Cold will often make these headaches worse for me, so I selected heat, strapped on the pad, and curled up on my bed with a cup of hot tea. My first observation, after about 20 minutes, was that the headache wasn't getting worse or moving to encompass more of my head. About 45 minutes after applying the SootheAway, my headache was actually gone, and I was very pleased not to have needed to use any medications beyond the caffeine in the tea. For a Migraine, I prefer cooling. I took my abortive medication, strapped on the forehead and temple pad (upper left in image), and stretched out on my bed. The pad cooled quickly. Since this was my first time using it for cooling, I had set the temperature a bit too cold, but a quick touch of a button on the main unit quickly fixed that. The constant correct temperature and bit of pressure from the pad definitely made me more comfortable while waiting for my medication to work. The pad stayed at the right temperature, eliminating the need to get up and get a fresh gel pack from the freezer. Another good feature is that these pads don't slip. I wasn't constantly putting my hand to my head to get it back in the right place as I've always had to do with gel packs. My experience with the SootheAway was positive, and I'll continue to use it when I get a Migraine or headache. Attaching the pad to the unit is easy when I don't have a Migraine. When I had a Migraine, I couldn't see very well and wasn't very coordinated, so I've left the forehead and temple pad attached to my unit so it's already set up for a Migraine. The forehead and temple pad is too large for children, but a pediatric pad will be available soon. The SootheAway was developed for Migraine and headache relief, but other pads are available, and more are in development as a result of patient requests. I've used the universal pad a couple of times for shoulder pain, and it was very helpful. For more information about the SootheAway Continuous Thermal Therapy device, see the SootheAway web site. Disclosure: Innovative Medical Equipment, the manufacturer of the SootheAway, provided me with a SootheAway unit for review. I have no other affiliation with the company.